The notion of TV viewing and cancer is revisited. For the first time ever the approximate cancer risk of using television transmitting and receiving technologies is split into its two main component parts i.e. that of light at night hazard from the TV screens and room lighting themselves and that of Radio Frequency Emissions. With regard to radio frequency emissions the risk for male and female hormonal cancers dominates the light risk by a factor of approximately 3/2. Both are discussed in terms of circadian disruption, melatonin suppression and its effect on the body’s natural cancer protective/suppressive systems. The overall relative risk of developing a hormonal cancer in the 21st century is about 5 times its value in 1947 when the enemy in your front room and TV emissions first appeared. The Cancer Research UK organisation has recently announced in a TV campaign that despite more people surviving from cancer than dying from it, overall incidence rates appear to be continuing to rise. When a deeper analysis is made it is apparent that in recent years the incidence of some cancers has actually fallen substantially. Male lung cancer rates presenting perhaps the most obvious and explainable trend showing a decline some 10-15 years or so after the male peak in tobacco use. Female smoking lagged male smoking in popularity and as a result the peak in female lung cancer has not long passed us by. Some cancers, however, do indeed have overall incidence rates that would appear to have been continuing to rise in Britain as far as historic statistics are available even though I have recently shown that the same have already peaked/ saturated in the USA . These would appear to be substantially the male and female ‘hormonal’ cancers namely Prostate Cancer and Breast Cancer. Researchers and epidemiologists too numerous to reference here, save a few examples, have sought to explain increased incidence of all cancers and these types in general in terms of causation by new or increasing environmental carcinogens. Hallberg and Johansson (2002)  concluded there is a common environmental stress that accelerates several cancer forms such as colon cancer, lung cancer, breast cancer, bladder cancer and malignant melanoma. Further they stated that every effort should be taken to identify and eliminate this stress. This present paper aims to elucidate that said stress in far more detail. Some have sought to explain increases in brain cancer and melanoma skin cancer in terms of RF (radio frequency radiation), see Hallberg and Johansson (2011) . They discuss RF radiation in terms of a weakening factor to the immune system. I have previously sought to enquire similarly if RF radiation is somehow a smoking gun when it comes to cancer? I have considered UK statistics  and world statistics and geographic distributions [5, 6]. Breast, prostate, leukaemia and brain cancers were shown to be very closely correlated with each other and with the growth of either TV receiver use and/or broadcasting of TV signals in the period 1971-2002, but not with general per capita growth. The sum total of incidence of prostate and breast cancer combined in the period 1947 to 2002 is extremely closely correlated with the number of TV licenses issues in the UK R>.99. This is suggestive of an extremely close association with TV receiver use and/or the broadcasting of TV broadcast emissions. Use of polynomial expansion to predict cancer incidence beyond 2010 suggests a long terms saturation for Leukaemia incidence trend at circa 2005 and a fall thereafter, similar results are obtained for breast cancer in the medium term with about a 6 year lag. This seems not inappropriate when documented latency periods are taken into account. I proposed then that reasons for (3) above may have been either due to the use of CRT TVS and monitors coming to an end or the fact that many competing types of wireless technologies are actually reducing risk. One thing I didn’t consider at the time was the effect of light emissions from TV screens or the fact that inherent in late night TV viewing is often exposure to larger amounts of artificial light in the lounge or other rooms of people’s houses nor did I consider the fact that daytime television viewing would have caused more people to be indoors therefore depriving them of the chance to acquire natural daylight and vitamin D.
As early as 1995, Web and Puig-Domingo (1995) first pointed out that although many clinicians totally ignore melatonin status, it interacts with and controls the metabolic activity of many endocrine and non-endocrine tissues within the body . It has been known from animal models since 2000 that all three pineal indoles increase the activity of superoxide dismutase and lower the ratio of oxidized to reduced glutathione in the brain, see Liu and Ng (2000)  . In other words Melatonin, 5MTT have powerful antioxidant anti free radical properties. At least from the lighting perspective Stevens and Rea (2000) appear to concur with my present hypothesis. Kos-Kudla (2002)  concluded that the presence of a negative correlation between plasma melatonin and IGF-I concentrations in patients with neoplastic disease implies the existence of an additional defence mechanism based on the oncostatic influence of melatonin. Sephton and Speigel (2003)  commented that emerging data in the human and animal literature suggest that circadian regulation may be an important prerequisite for the maintenance of host defences against cancer. Thus, stress-related circadian disruption may have negative implications for cancer prognosis. Further their conclusion was that psychosocial effects on cancer progression can be measured, and possibly mediated, by the disruption of circadian function. In 2005, Stevens (2005)  commented that global impact of breast cancer is large and growing. Further was the comment that it seemed clear that something about modern life was the culprit. Support has developed for a possible role of “circadian disruption,” particularly from an altered-lighted environment (such as light at night). Lighting during the night of sufficient intensity can disrupt circadian rhythms, including reduction of circulating melatonin levels and resetting of the circadian pacemaker of the suprachiasmatic nuclei. Reduced melatonin may increase breast cancer risk through several mechanisms, including increased oestrogen production and altered oestrogen receptor function. The genes that drive the circadian rhythm are emerging as central players in gene regulation throughout the organism, particularly for cell-cycle regulatory genes and the genes of apoptosis. Aspects of modern life that can disrupt circadian rhythms during the key developmental periods (e.g., in utero and during adolescence) may be particularly harmful. Epidemiologic studies should consider gene and environment interactions such as circadian gene variants and shift work requirements on the job. Melatonin has been experimentally implicated in skin functions such as hair growth cycling, fur pigmentation, and melanoma control, and melatonin receptors are expressed in several skin cells including normal and malignant keratinocytes, melanocytes and has strong antioxidant activity in U/V exposed skin cells, see Slominski et al 2005 . Bartsch and Bartsch (2006)  have proposed that melatonin disruption may be at least in part responsible the growing epidemic of cancer, especially breast cancer in modern society. Further Carillo-Vico et al (2006)  show immunomodulatory role of melatonin, with regard to infection, inflammation and autoimmunity and their evidence strengthens the notion that the nature of an immune response may be modified, and therefore therapeutically manipulated, by circadian effector signals. Alterations in melatonin receptor expression as well as changes in endogenous melatonin production have been shown in circadian rhythm sleep disorders, Alzheimer's and Parkinson's diseases, glaucoma, depressive disorder, breast and prostate cancer, hepatoma and melanoma, see Seithikurippu et al (2008) . My expanded television hypothesis or at least a part of it then becomes inherently simple. Exposure to more light at night as a result of TV screens and the attendant room lighting that goes with them significantly lowers individuals’ serum melatonin levels resulting in more cancers. West al (2011)  has shown that blue light as if from an LED at 469nm is very potent at suppression melatonin and has an equivalent colour temperature > 4000K. TV screens and monitors have a colour temperature of between 6500 and 9300K and therefore represent a significant hazard for melatonin reduction and hence and hence would be expected to be associated with increased risk of cancer for this reason alone. comments on how lighting has become a ‘public health issue’ and is particularly concerned about the blue component in HID street lamps which have can have colour temperature of anywhere form 3000-20000K. The colour temperature of TV screens and monitors is within this range and so they would be expected to be equally dangerous but yet until this publication would appear to have been given little, if any, attention. My experimental analysis is based on readily available public domain data from a number of sources including the BBC and Cancer Research UK. Figure 1: Incidence of ‘hormonal’ or endocrine sensitive cancers (sum of breast and prostate) as a function of number of TV licences issued. A direct positive correlation with a Regression factor of > .99 is seen. The two-tailed P value equals 0.0001 by all conventional criteria; this difference is considered to be extremely statistically significant. The odds ratio for these two hormonal cancers would appear to be of the order of 5 compared to before TV use was common. Figure 2: Saturation of TV penetration followed by saturation of prostate cancer incidence some 20 years later. This is perhaps not surprising given that prostate cancer is known to have a long latency period and can be dormant for up to 20 years before detection. The experiential results strongly support the hypothesis that TV sets and attendant lighting cause circadian and endocrine disruption which can lead to cancer. That is not to say they are necessarily carcinogenic themselves but simply that they disrupt the body’s natural protective system making it more susceptible to oxidising free radicals, radiation and random mutations. We can also enquire if there are parallel dimensions at work here. 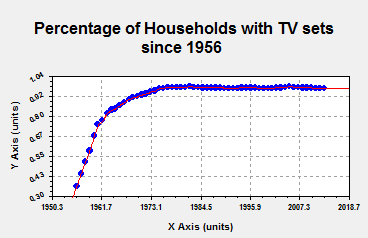 Nothing in these findings is at odds with my previous findings  because for example as the number of TV sets has grown so has the number of transmitters. I have recently shown that RF emissions do appear to also have an association with certain cancers. The so called ‘RF cancers’ . I have further shown that for a very small cohort in my local area all newly reported cases of cancer I have heard of appear to have lived in residences exposed to more than the average background of RF field strength . One suggestion is that this RF might simply act on the pineal gland rather in the same way that light does. For example, Clark et al (2007) found among postmenopausal women, increased residential RF exposures, transmitter proximity and visibility, and temporally stable 60-Hz exposures were significantly associated with increased E1G excretion. This association was strongest among postmenopausal women with low overnight 6-OHMS levels . Another suggestion is that RF can generate free radicals in the body by disturbing gas/liquid interfaces . Another suggestion is that certain modulation schemes can interfere with complex molecular motions of the immune and cellular regenerative systems. With particular reference to the immune system there is theoretical and experimental evidence that one should only expect transient increases in cancer rates with the introduction of each type of new technology. Such transients are observed in figure 2 and have been discussed in more detail elsewhere, see Lauer (2013)  and by the present author . Besides the above observations, I have also noted a quantum mechanical effect of the effects of RF on both trees and people which I have shown to be related to electromagnetic Aharonov Bohm effect which shows damage at very specific distances from transmitting antennas and is related to electromagnetic vector potential . This parameter effectively carries information only i.e. the modulation envelope of an RF emission. Since the pineal gland has been shown to be magnetic field sensitive at ELF and modern modulation envelopes carry ELF frequencies we have a good connection here. My theory is given good credence in the newly released book Electromagnetic Fields in Biology and Medicine edited by Marko S. Markov . Such a phenomenon could under some circumstances of demography produce either a hugely exaggerated risk or a hugely diminished risk, not normally accounted for by epidemiologists. Sadly it would appear that the phenomenon is true. This may also account why the work of Cherry which takes into account TV transmitter antenna beam patterns shows such an elevated risk for certain types of cancer . From the above work it appears that TV sets their related light emissions, radio waves, X ray emissions and ability to concentrate pollution and radon in earlier CRT models only, have resulted in a cumulative odds ratio of circa 5. One would therefore expect the individual risks for these components to all be less than 5 but perhaps accumulate to that value or similar. On the other hand Hansen et al (2012)  suggest odds ratios as high as 2.8. Conlon et al 2007 suggest an odds ratio of 1.4 for shift work and prostate cancer . Thus an average estimate for both cancers is 1.9. It is reasonable and fair to assume that the risk in exposing ourselves to bright Television screens and other household lighting sources any time after about 8 o’clock at night which have a colour temperature high enough to contain the blue wavelengths which can diminish melatonin will be of the same order as those for night shift working. Dolk I (1996) found a relative risk of 1.83 for Leukaemia and skin cancer within 2 km of the Sutton Coldfield TV transmitter . Wolf and Wolf found an odds ratio of 4.15 for various cancers near a mobile phone transmitter in Israel. This and other statistics from around the world relating to RF exposure are to be found at http://apps.fcc.gov/ecfs/document/view?id=7520940908 . The average risk ratio taken from these two studies is 2.99. Khurana et al (2010) found that eight of the 10 studies reported increased prevalence of adverse neurobehavioral symptoms or cancer in populations living at distances < 500 meters from base stations . None of the studies reported exposure above accepted international guidelines, suggesting that current guidelines may be inadequate in protecting the health of human populations. Tuyn et al (1985) considered the dose rate due to X-rays in the vicinity of TV and VDU screens was determined using a xenon-filled proportional counter. The results confirm that the X-ray dose rate around such devices is extremely low. Of greater impact for the exposure of the population was found to be the influence of the electrostatic field in the vicinity of a TV or VDU screen on the local concentration of radon daughters. Such measurements were performed using air sampling at various distances from the screens on a filter-surface barrier detector unit to identify the radon daughters. The radon concentration in the room was simultaneously measured using TLD in a device based on electrostatic precipitation. It is shown that the presence of an electrostatic field during operation of a TV or VDU screen reduces the radon daughter concentration in its vicinity. In other words the result is counter to the expected hypothesis. It is worthy of consideration, however, that when the device is switched off any radon concentrated may leak back into the living space. Further Mahrok and Al-Dulamey (2005) showed variable emissions always less than background radiation levels. . Perhaps, therefore, for the purpose of the present estimation we can leave radon out of the equation. Thus the cumulative average risk ratio in relation to cancer when owning a TV set and been exposed respectively to both light and RF radiation is 1.9 + 2.99 = 4.98. This is in remarkable agreement with my experimental observation. Moreover, I have shown that the TV set is truly an enemy in your front room but that its light emission and attendant light exposure one probably gets from other light in one’s lounge of other parts of the house equates to some 38% of the total risk in using the technology. The rest comes from the all-pervasive RF radiation required to operate the technology and at least in part its part on melatonin suppression for some sections of society. Finally, it is interesting to note that Hallberg and Johansson remark on an explosion of melanoma skin cancer after the 1950’s in Sweden and blame it on 90MHz FM broadcasting . Of course TV transmission began in earnest about the same time and a new enemy appeared in our living rooms. Melatonin receptors are expressed in several skin cells including normal and malignant keratinocytes, melanocytes and has strong antioxidant activity in U/V exposed skin cells, see Slominski et al 2005 . Thus light exposure from TV sets and attendant household lighting could be having a similar effect on melanoma rate as for hormonal cancer rates. It would seem there is a strong case for introducing all cable technology using either copper or fibre to deliver our TV transmissions to our homes. Further it would appear the best time to watch television is in the morning thereby boosting serotonin rather than at night diminishing melatonin as many and most of us do. · The sum total of incidence of prostate and breast cancer combined in the period 1947 to 2002 is extremely closely correlated with the number of TV licenses issues in the UK R>.99. P= 0.0001. This is suggestive of an extremely close association with TV receiver use and/or the broadcasting of TV broadcast emissions. · For the 1st time ever a scientific paper has separated out the risks of using Television broadcasting (the enemy in your home) into relative components. · Exposure to radio frequency energy would still appear to pose a larger risk than that form exposure to light form the TV screen and attendant household lighting itself but this latter risk is far from insignificant. · Use of TV broadcasting and receiving technology in its present form poses a risk for hormonal cancers such as breast and prostate some 5 times greater than if it were not present i.e. compared to and calculated from pre-TV era cancer incidence figures. · The analysis here is suggestive that hormonal/RF/endocrine/Cancer rates will not continue to rise indefinitely as seen in the recent CRC UK website projections and TV advertising campaign but will, in fact, saturate at more or less present day levels as they have done in the USA. If some RF and LAN ( light at night ) can be removed we may even be able to significantly reduce these rates.